Each year, Colorado public libraries offer engaging summer reading programs to encourage children and teens to read for fun and to prevent summer learning loss. In summer 2014, the Colorado State Library invited Colorado public libraries to ask parents in their communities to help evaluate the effectiveness of these programs by completing a survey. Sixteen libraries chose to participate, and 672 parents/caregivers completed the survey. About half of all respondents reported that their children’s enjoyment of reading, reading skills, and reading by choice increased after participating in summer reading. 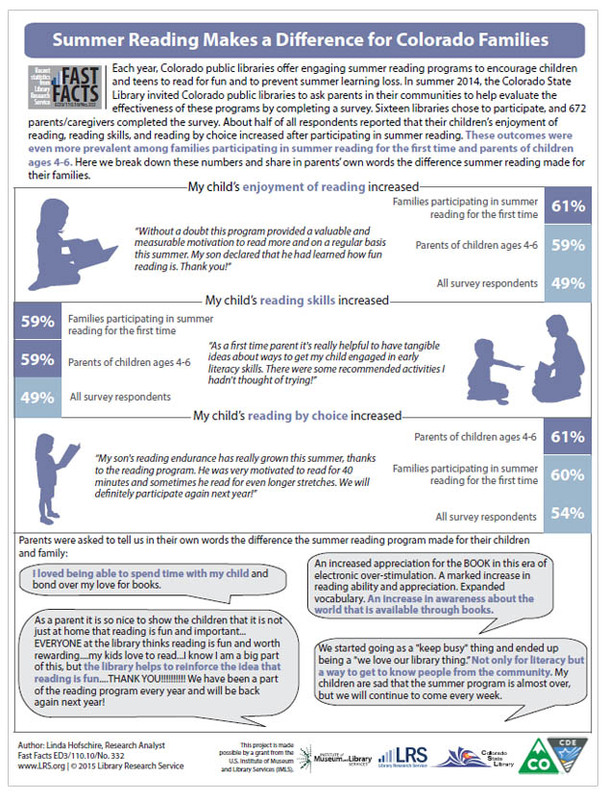 These outcomes were even more prevalent among families participating in summer reading for the first time and parents of children ages 4-6. Here we break down these numbers and share in parents’ own words the difference summer reading made for their families.